DigiFab StampaJetI-64 digital textile printer, DigiHeat press fixating unit, and Evolution textile RIP being evaluated by Nicholas Hellmuth, FLAAR Reports. 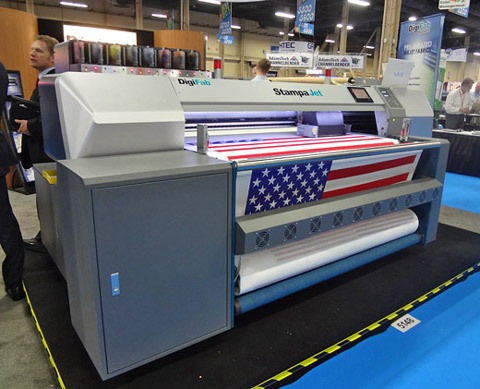 DigiFab Systems offers StampaJet I-64 textile printer, Evolution RIP, and DigiHeat press. The DigiFab StampaJet printer was exhibited several times last year and we are looking forward to updating our notes in expos held during this current year. 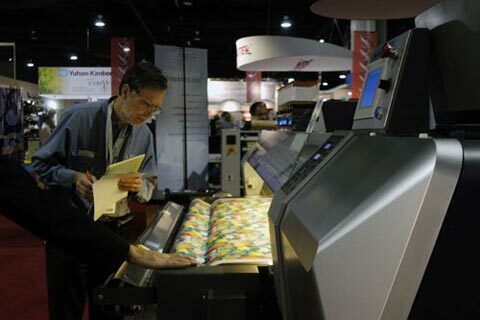 SGIA 2008 was showcase to several high-end digital textile printing solutions. 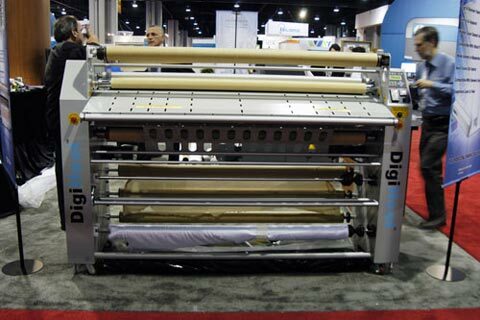 The booth of DigiFab Systems introduced their StampaJet I-64 textile printer. 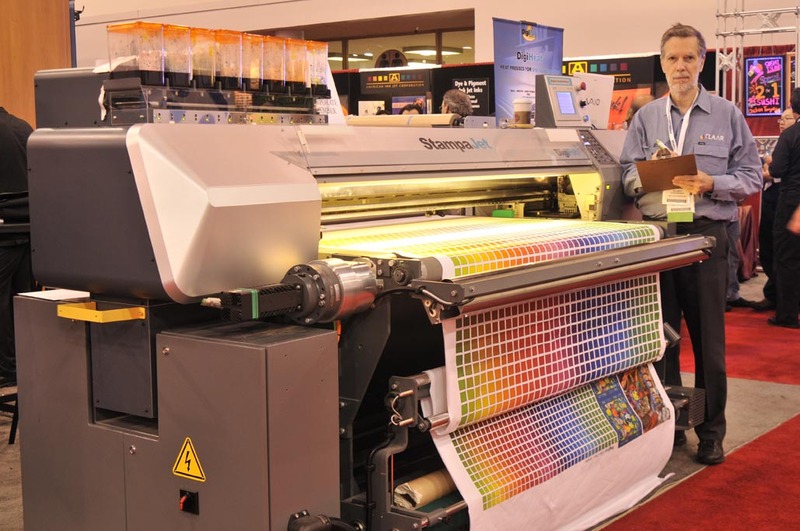 This is a serious production printer with a heavy-duty industrial fabric feeding system. 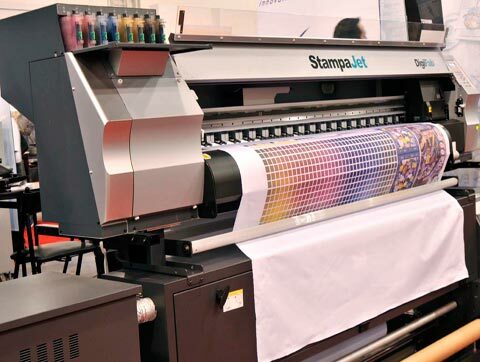 The FLAAR Report evaluation on the StampaJet digital textile printer has been available since after SGIA ‘08. Heat Press for fixation and heat press for calendering dye sub transfer paper. Several trade magazines have asked FLAAR to write articles on heat presses for fixation of textile inks and for calendering dye-sublimation transfer paper to polyester. I prefer to inspect the equipment either in the factory or at least in a demo room (trade shows are too hectic). It also helps to find and visit a printshop that has the heat press in action. So as soon as we can arrange access to the DigiHeat press, we will continue our work on evaluating this product. In the meantime you can locate DigiFab either in Los Angeles or in New York (the two centers of fashion and style, hence centers of digital printing on textiles). 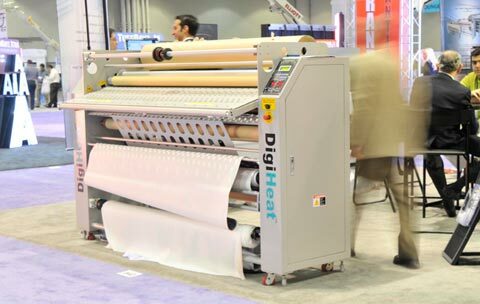 This is the DigiHeat Roll to Roll Heat press at SGIA 08. 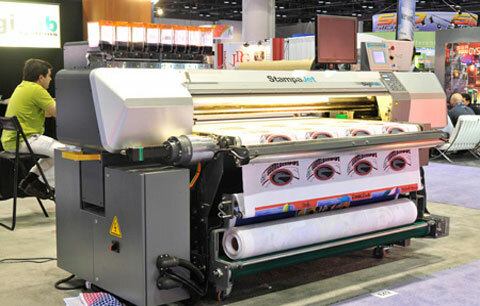 StampaJet I-64 textile printer has a bulk ink feeding system consisting of eight 2000ml. ink tanks. 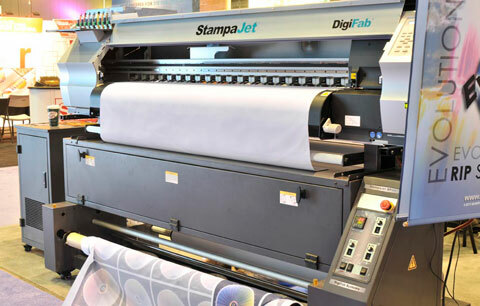 The StampaJet uses a sticky-belt, a combo-style moving transport belt but with “glue” so that the fabric stays put and does not stretch in the wrong direction during printing. So this printer is dedicated to printing directly on fabrics, not as much onto transfer paper (which does not need a conveyor belt anyway). The “glue” on the adhesive belt of this printer is activated by an infrared drier that is located after the washing station. StampaJet I-64 comes with a rotary washing station to remove any excess ink from the sticky-belt to avoid bask printing onto fabrics. DigiFab offer CAD-RIP software solutions. Digifab Systems booth at SGIA 08. 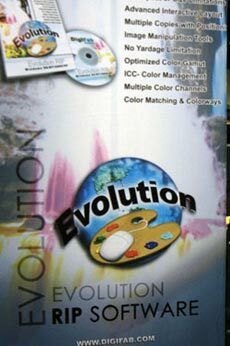 Evolution RIP for textile printing. The two advantages of Evolution RIP for textile printing is that DigiFab is totally dedicated to wide-format inkjet printing on fabrics: both direct to textile as well as dye sublimation. 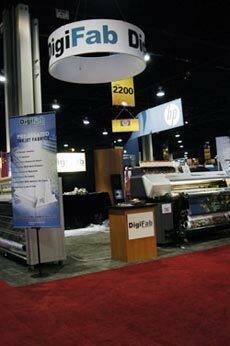 DigiFab has years of experience and is also a family owned and family operated business. These are all plus points. To evaluate the Evolution RIP it is best to undertake this in the company demo room, so that will be our next step on the RIP software of DigiFab. The Stampajet textile printer was evaluated by Nichollas Hellmuth. Most recently updated May 10, 2013.